Blimey. Well Lyddle End 2050 seems like a popular idea. How exciting. Loads of people have got in touch, all have promised not to be slack and I'm excited to find myself at the nexus where the world of futurism connects to the world of model railways. It's the kind of place you'd find a gigantic interdimensional shiftship. 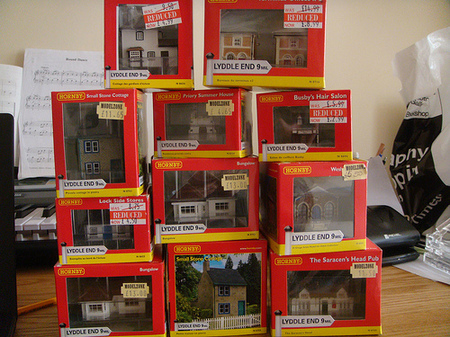 The first lot of buildings are ready to go out to people, I shall be enveloping tomorrow. And I'm going to try and find local Hornby suppliers for all of you not in the UK. And, so we can all see work in progress, I've put a tumblr here. It should aggregate any flickr picture and any delicious bookmark tagged lyddleend2050.